Francium is the second rarest and the most unstable naturally occurring element on the periodic table; only astatine is rarer. A product of a disintegration of actinium, which undergoes beta-disintegration 99% of the time, francium is so highly radioactive that its most stable isotope (Francium-233, formerly known as actinium-K) has a half-life of merely 22 minutes. As such, only 20-30 grams of the element are present at any given time in the earth’s crust, limited to trace amounts in uranium and thorium ores. Francium can be produced in the laboratory via bombardment of thorium with protons or radium with neutrons, but only in small quantities--the largest amount ever synthesized was a cluster of 30,000 atoms. The element has never been observed in bulk; with the lowest electronegativity of any element on the periodic table, it would immediately vaporize due to the extreme heat of decay. Thus, scientists estimate that francium’s theoretical properties are similar to the other members of the alkali metals family. There are no commercial applications for francium because of its instability. Dmitri Mendeleev predicted the existence of Francium in the 1870's, calling it “eka-caesium” because of its similarity to cesium (“eka” meaning one element down on the periodic table). The element was discovered by French chemist Marguerite Catherine Perey of the Curie Institute in 1939 while analyzing the decay of actinium; named for her country of origin, Francium would become the last naturally-occurring element to be discovered rather than being synthesized in a laboratory. Francium is a S-Block, Group 1, Period 7 element. The number of electrons in each of Francium's shells is 2,8,18,32,18,8,1 and its electronic configuration is 1s2 2s2p6 3s2p6d10 4s2p6d10f14 5s2p6d10 6s2p6 7s1. In its elemental form francium's CAS number is 7440-73-5. The francium atom has a radius of 270.pm and it's Van der Waals radius is 348.pm. Francium was discovered by Marguerite Perey of the Curie Institute in Paris, France in 1939 although its existence was predicted by Mendeleev during the 1870's. Francium, formerly known as eka-caesium and actinium K, is the second rarest naturally occurring element, the first being Astatine. Francium has the lowest electronegativitiy of all known elements and it was the last element discovered in nature. Outside of the laboratory, only trace amounts of francium can be found in uranium and thorium ores. Out of all of the naturally occurring elements, francium is the most unstable. Due to its rarity and instability, commercial applications for francium do not exist. Francium information, including technical data, properties, research, and other useful facts are discussed below. Scientific facts such as the atomic structure, ionization energy, conductivity and thermal properties are also included. 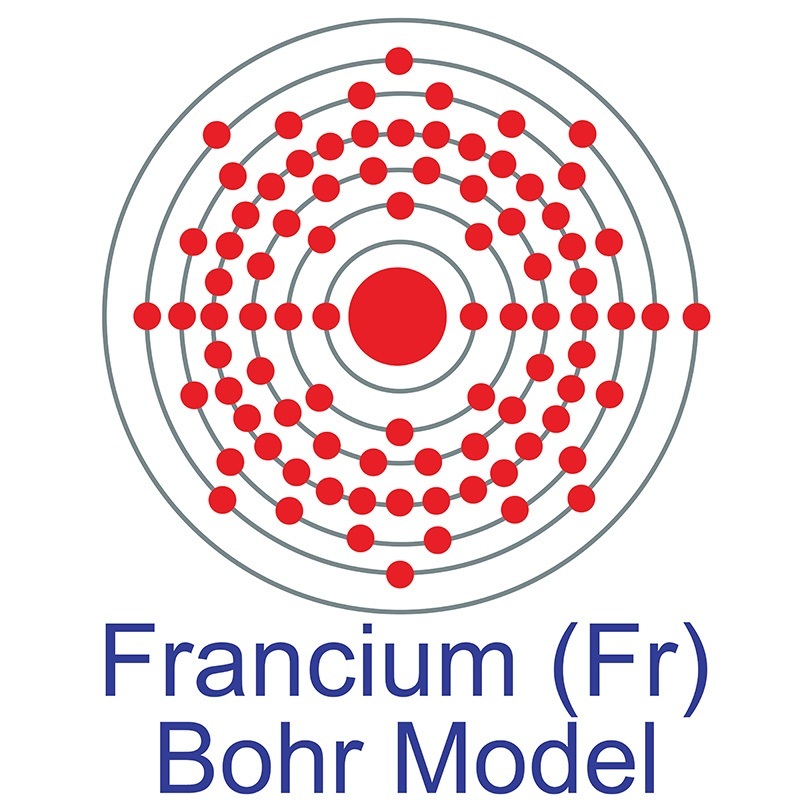 Francium has no stable isotopes.